About The House – About the House is a home inspection company serving the Northern New Jersey areas. About the House is a home inspection company serving the Northern New Jersey areas. New Jersey Home Inspections, conducted by Darren Miller from About The House, is your assurance of quality, integrity & professionalism. Darren is licensed & certified to conduct New Jersey home inspections, radon testing & wood destroying insect inspections. Serving all of Northern New Jersey, Bergen, Essex, Morris, Somerset, Union, Sussex, Warren & Hunterdon Counties, our goal is to provide you with the best possible home inspection available. Darren, considered to be among the elite of New Jersey licensed home inspectors, will promise you his best effort at conducting your home inspection. Darren gets about 90% of his inspections from past clients; he knows a satisfied client is the best sales force for future business. You will not get a more thorough home inspection or a more detailed report anywhere. Darren understands that purchasing a home is one of the most important decisions & investments you will make. Our typical client is someone who doesn’t mind paying more for a high quality service, as long as they get what they pay for. They want to know their home inside and out, and we have built our reputation on living up to this expectation for over 20 years. Darren Miller, New Jersey Home Inspectors License #24GI00019700, is a certified NJ UCC Building Inspector ICS (NJ DCA) # 009387 and is a certified Credentialed Wood Destroying Insect inspector #214. A home inspection conducted by About The House, using the New Jersey State Home Inspection and ASHI standards of practice will give you a clear cut, un-biased view of the house. This information will allow you to make a decision based on information rather than guess work. When choosing a New Jersey licensed & certified home inspector….”About the House” is the only information you need. Here is the latest from the NJDEP radon division. I specialize in new construction; from phase inspections to just a final inspection, we are there to help you along! So, your newly constructed house doesn’t need a home inspection? Read this New Home Inspection Nightmare or this New home inspection; Waste, Fraud, Abuse first. There are many types of exterior sidings, from bricks to stucco. I see the same problems with all types of exterior covering, here are just a few types of exterior coverings & what you should look for. Bricks: As per NJ IRC R703.7.5 & R703.7.6, brick veener should be installed with weep holes and flashing at many different locations. At the base (just above grade level), under all windows, above most windows and doors. Flashing & weep holes remove any water that penetrated the brick. Without weep holes, any water that gets behind the brick has no way to get out; wood rot & mold is the result. See BIA for additional information. Vinyl siding- The Vinyl Siding Institute has developed what is known as the industry standard to manufacture & installing vinyl siding. The 2 biggest problems with vinyl siding is not installing the proper flashing & not allowing for movement of the siding. 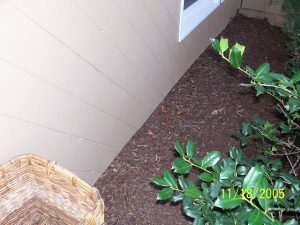 Most flashing cannot be seen (installed before the siding); the only way you find out it’s wrong is when leakage occurs. The siding can be nailed too tight (vinyl siding should be “hung”, not secured) and most installers or homeowners will caulk the thru wall penetrations at the siding; caulking should be applied where the penetration meets the SHEATHING! The most common problem wood, vinyl & aluminum siding is it’s too low to the ground. This is a result of poor planning during construction or years of building up top-soil or mulch. If the ground is in contact with wood, vinyl or aluminum siding, it’s a condition conducive to wood rot (sheathing and/or sill plate) and wood destroying pest infestation. Let’s be honest, you probably don’t know about these things. That’s where I come in; Hiring me to conduct a home inspection, even if you have lived in your current house for years, is a good idea just so you at least know what needs repairs, replacement or just plain maintenance.